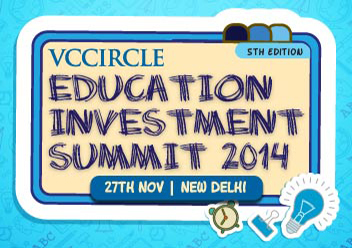 With internet and digitisation taking over the traditional mediums of learning and changing data consumption habits in India, the 5th edition of VCCircle Education Investment Summit will focus on innovations & opportunities in the digital education segment, including e-classrooms, digital books & content, e-tutorials, test preparations, distance learning & edutainment. The event is scheduled for November 27 at Hotel Sheraton, Saket, New Delhi. The panel discussion will shed light on how players in the space are aiming to bring together the digital world of education in India as well as opportunities & challenges faced by entrepreneur-investors in innovating, scaling up businesses and generating returns. How are players keeping ahead of the curve and delivering innovative business models? What initiatives are driving students’ interest in digital platforms? Are direct marketing routes successful? Do schools, universities, coaching institutes still remain the caveat for driving adoption of digital content & mediums? Changing landscape of education delivery: What will we see next? The summit will feature leading and emerging entrepreneurs, investors, consultants looking out for latest trends & next big opportunity in the K-12, higher education, training space, besides newly emerged segments such as vocational training, pre-school and interactive digital e-learning courses. Register now to avail yourself of an early bird discount of 20 per cent till Oct 21 and thereafter 10 per cent till Nov 7 or you can even write to Sandeep/ Ipshita at register@vccircle.com or call 0120-4171111.